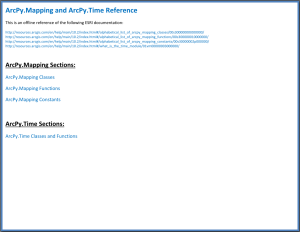 This is an offline reference for the ArcPy.Mapping and ArcPy.Time modules in PDF format. It includes classes, functions and constraints. I tried to organize it in a way which allows for navigation throughout it just by clicking. Every blue link is clickable. It’s also searchable, so you can find certain keywords. Click the image below to view the PDF. It can also be saved by right clicking the image and using Save As.